Sleeps 3 Ercan Airport 45 minutes drive Very romantic atmosphere with a fireplace. There is a steep path from the parking place. 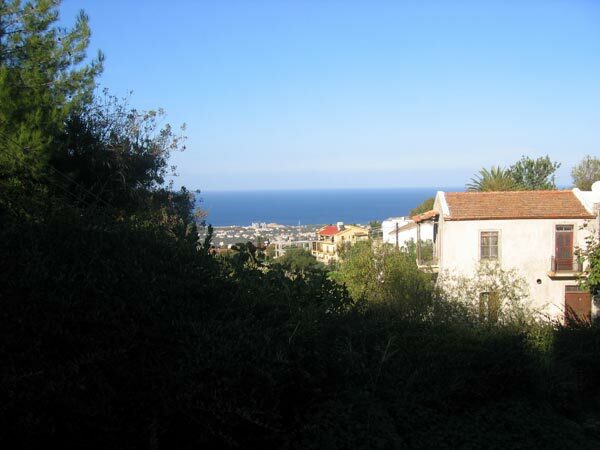 The Gardens are situated high above the old village of Bellapais, close to the house once lived in by Lawrence Durrell. 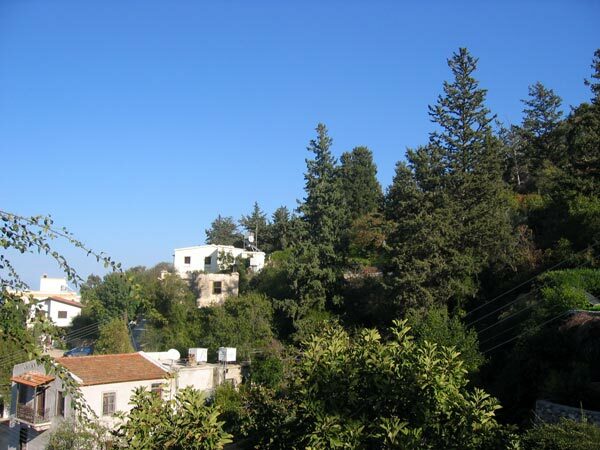 Gardens of Irini was bought by the Guthries in 1952. John was a composer and Vivian a painter. As the years passed they built a studio, and a gallery for Vivian's paintings. Lily cottage was restored for their daughter, Deirdre, who still lives on the property. Right up at the top of the village, among green shrubbery and close to Lawrence Durrell's house, the Gardens of Irini is a real little paradise. There is one studio and a one-bedroom apartment (Lily Cottage), both self-catering and adjacent to a traditional village houses. Eash has a little private courtyard, a kitchen decorated with lovely rustic cupboards and cookers, the main room has a fireplace, lovely rugs and Oriental rice-paper blinds; the beds are comfortable, and the bathrooms have a shower and bath - what more could you want? Food? Worry not. The charming owner Deirdre Guthrie cooks up a kicking breakfast, and for dinner (an extra charge), she prepares scrumptious food. All meals are served in the cool, leafy garden. And if you're really lucky, Deirdre might tell you some great stories from her days as a professional flamenco dander in Spain. Booking in advance is advisable. Originally an old peasant house, Lily cottage has been converted into a spacious bed sitting room upstairs. Downstairs the former donkey barn has been changed into a large kitchen and bathroom. The cottage is decorated throughout with original paintings by Vivian Guthrie, and other local artists. There is an air-conditioning / heating unit plus a large fireplace to make our visitors comfortable in all seasons. The kitchen opens onto a patio with an orange tree and flowers where you can enjoy your own privacy. The Studio was originally built for Vivian in the late fifties, where she created a prolific collection of paintings. 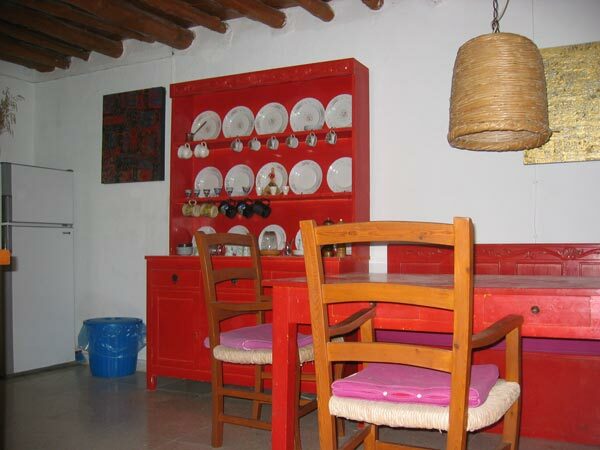 Several years ago a fully equipped kitchen and bathroom were added, making The Studio a very attractive retreat for visitors seeking the beauty and peace of Bellapais. From the front door you can step into a small garden, full of orange and tangerine trees and a wild array of pot plants centered around the fishpond. This is a place to sit and dream just listening to the fountain. 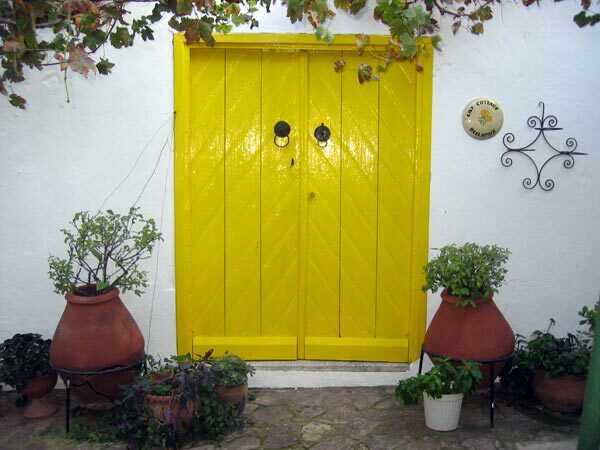 At the back,the kitchen door leads into the courtyard shaded by a large bay tree and an old rambling grapevine. Here you can lounge comfortably while you read or eat your meals. This beautiful bed-sitting room is surrounded by windows on three sides, and decorated with Vivian's colourful paintings. There is a large comfortable double bed, and a cushioned banquette in the corner by the fireplace. An air-conditioning/heating unit keeps the room at the required temperature all year round. 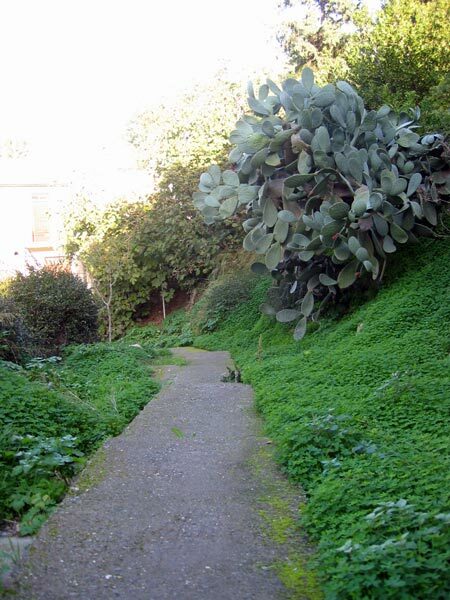 From "The Gardens" there is a steep path which leads down to the 13th century Bellapais Abbey. Surrounded by beautiful grounds the Abbey dominates the village square. Visitors can wander through its mystical dark interiors and climb onto the roof for breathtaking views of the mountains and the sea. There are several delightful restaurants where you can dine overlooking the Abbey. For those who prefer to cater for themselves local shops provide fresh food daily. The famous town of Kyrenia, with its Venetian castle and picturesque harbour, is 3 miles away. If you wish to go further afield you can visit the ruined palace of Vouni to the west. To the east lies the ancient city of Salamis. 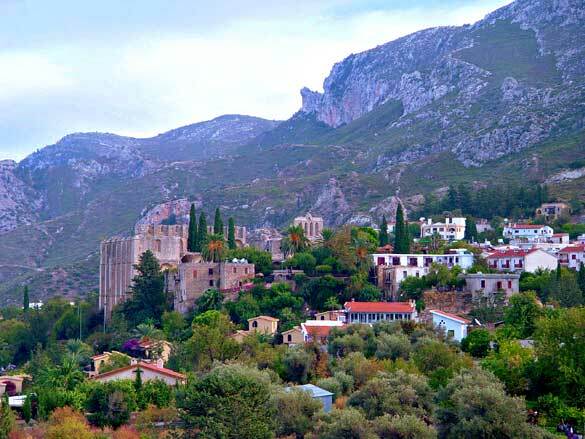 Bellapais village, with its gothic Abbey lies approximately 3 miles from Kyrenia, and a thousand feet above sea level. 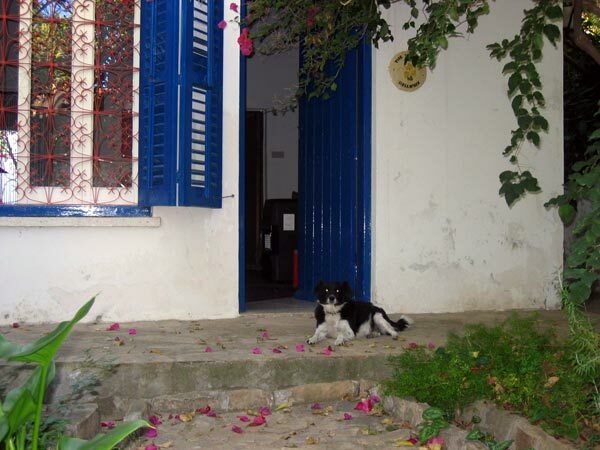 The beauty and history of this ancient village have inspired artists and writers for centuries. The nearby mountains are ideal for walking, bird watching and finding wild flowers. Prices include a welcome pack ie; eggs, butter, bread, cheese, tea , milk, beer, a bottle of wine, seasonal fruit and flowers. Bed linen and towels are changed once a week during the course of a full "Maid service". English, Turkish or international breakfast is offered for 5 British Pounds extra per person. 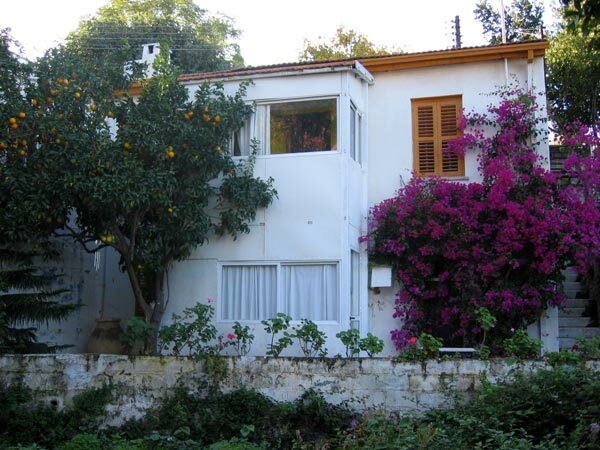 • Gardens of Irini is inside Bellapais Village. • The whole journey should take approximately 10 minutes.